I adore your artworks! May I ask what program do you use to create your artworks? Photoshop? And how much time do you spend on one drawing? You're welcome - Well deserved! 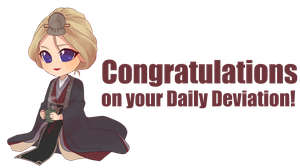 Congratulations on your Daily Deviation!!! I love this! So warm and peaceful looking, with so much to see. Yes, some of my graphics are marked as "traditional art"
Oh now I see... interesting sou you do both. When do you choose to do a traditional or digital painting and why?